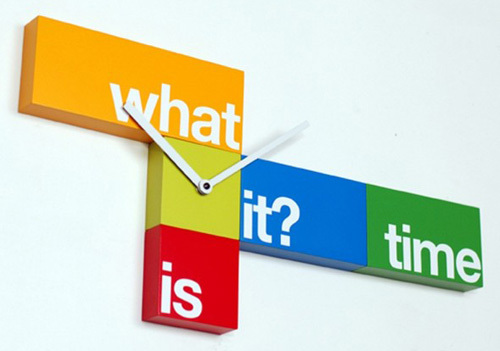 We all get the same 24 hours in a day but have you noticed that time seems to be flying by more quickly these days?... unless of course you're working some boring job somewhere which then makes time stand still. Some scientists believe our sense of time varies with age according to our experience. For young children and young adults, time seems slower because their lives are full of firsts... first time 'novel' events that are vivid, full of detail, making the data of memory very dense. As we age and experience these events again and again over time, there's less of an impression being made and time seems to move more quickly... kind of the 'been there', 'done that', theory of 'lets move on' speed of time. This is easily understood when we try to learn new things or acquire a new skill. It seems to take a long time to absorb and process new information, but once it's mastered, we no longer give it a second thought. While we all experience time at one second to one second, other theorists believe that as we get older. "the current of time seems to carry us along". In the documentary, Through The Wormhole: Does Time Exist?, scientists state that the passage of time seems to increase by the square root of your age. At age 10, you experience time as 1:1, a second goes by in a second. At age 20, it's 1:1.4 and at 60 it's 1:2.44, our perception of time about two and a half times faster. Okay, you lost me at the square root. But I do understand it as it relates to my perceptions of summer. As a child on summer vacation, July and August seemed endless, eternal, but as an adult, these two months zipped by leaving those long 'To Do' lists still undone. For many years I've been interested in the subject of time, not so much the science but in its record keeping, a record of existence, a way of leaving my 'mark'. For most, this 'mark' or record can only be seen backwards over a long period of time unless you're a Steve Jobs (Apple) or Mark Zuckerberg (Facebook) or Sergy Brin and Larry Page (Google) who find their genius and notoriety early in life. So when I read this first sentence in USATODAY, "If taking and posting one photo a day for an entire year seems like a daunting task, the folks over at ADAY.org have a proposition for you. On May 15, 2012, the Aday project is asking people around the world to pick up a camera and take a few photos to document their daily lives", I was hooked. ADAY.org is organized by the Swedish non-profit foundation Expression of Humankind. It supports scientific research and education centered around the photographic image and written word. ADAY's website read "photographing the world on a single day... One day a million views - add yours!" 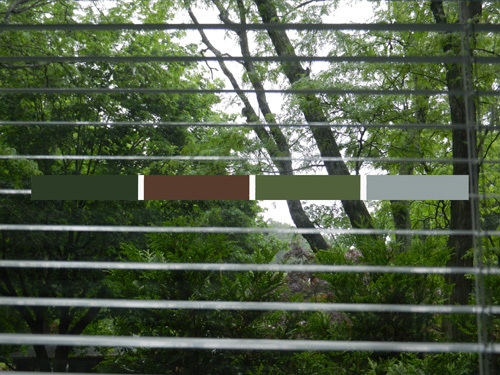 This image is a view from my bedroom window. Today's weather: 64º, rain, 92% humidity, 62º dew point with thunderstorms expected for most of the day. A good day to stay indoors, finish a few things already started, nothing too complicated, nothing requiring a brain or an ounce of creativity. Just finished breakfast... a slice of sweet chocolate bread, '365 Organic' strawberry yogurt and coffee. The rain is now heavy and the laziness of the day has me back under the covers to finish watching a DVD previously started last night. 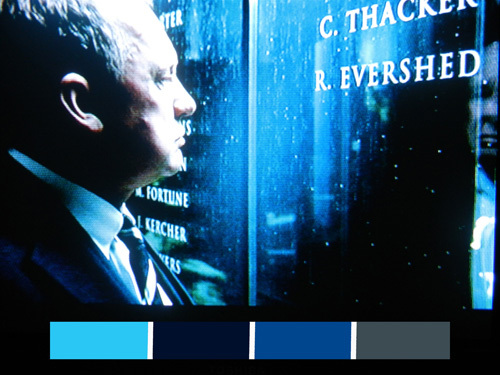 This image is of the final scene of the Series Finale, Season 10, of MI-5, a fictional spy drama produced by the BBC. This show now climbs to the top of my all time favorites. I'm missing it already... poor Harry! The rain has temporarily stopped... a good time to run some errands. 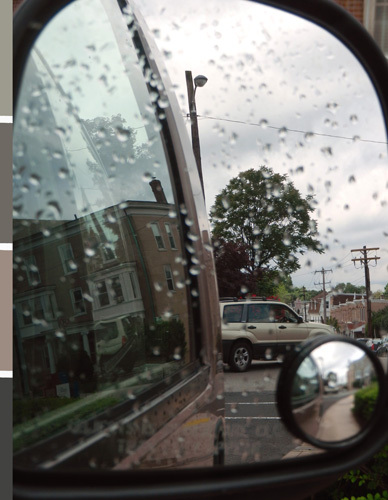 This image captures a distorted view of a corner in Jenkintown PA seen through the reflection of the van's passenger side mirror. 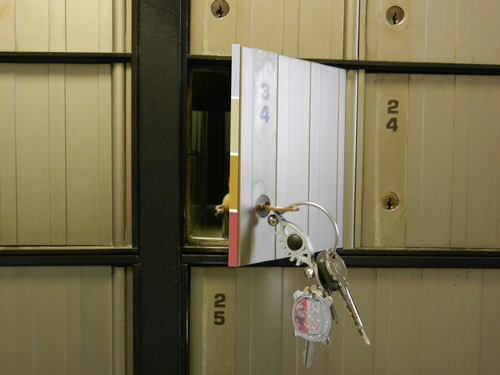 This is an image of my Post Office Box... Box 34. I've had this mailbox for many years. There's something nice about the anonymity of not having your exact physical location known, but those were the 'pre Google' days. "It's my way or the hiway"... just kidding. 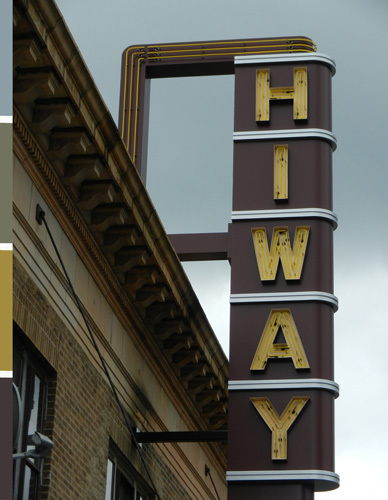 This is an image of a sign that belongs to the Hiway Theatre in Jenkintown PA. The owners of this movie theatre have changed several times over the years, but thankfully this classic sign remains. It is an exact replica of the original vertical sign that existed from 1940 until the 1980's. The cost to replace the sign was close to $50,000. In 2013, the Hiway will celebrate its 100th Anniversary! 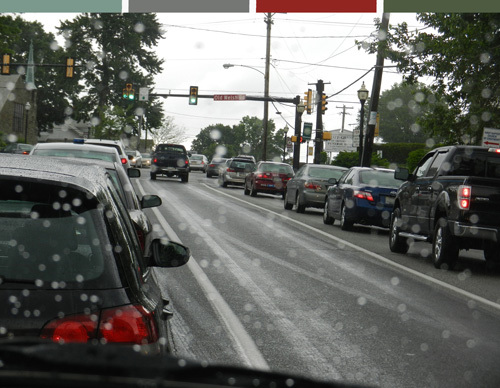 This image is of local traffic in the rain on Old York Road in Abington PA. We're heading north to the Willow Grove Mall to pick up a few saw blades from Sears and then to The Fresh Market for groceries. 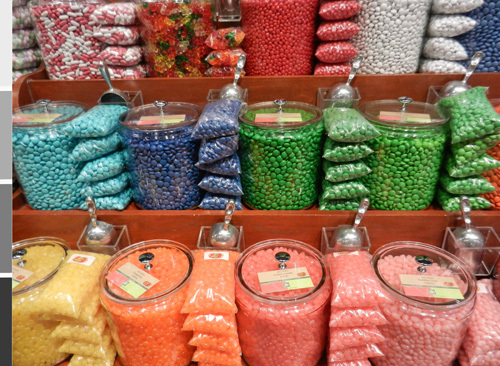 This image is of M&Ms and jellybeans beautifully arranged in the candy aisle of The Fresh Market in Horsham PA. This is the final destination of running errands before heading home. And no, I did not get a cart full of candy... just an eyeful of color on what otherwise has been a gray, rainy, rather desaturated day. The date for online viewing of the work, presented by participants in over 190 countries is projected for May 30th. On that day you can see it here. And so this is how a record of existence begins, with glimpses, snapshots, thoughts and collections capturing the moments in time that speak to who we are, what, when and why we are. John Lennon once said, "Time you enjoy wasting, was not wasted". How do you like to 'waste' your time? If you could take THE one picture of your day, what would it be? Have you begun your record of existence?... What does it look like? NPR: Why Does Time Fly By As We Get Older?... with two short videos: one of 'Every Day' with Homer Simpson and another by Maggie Starbard of people collecting memories seen here. Through The Wormhole: Does Time Exist? The discussion of how time is perceived begins about 11 minutes into the documentary seen here. And for all of you who remember what time felt like when it was 1:1.4 you might enjoy watching and listening to these: The Rolling Stones here and The Chambers Brothers "Time Has Come Today", the long psychedelic version here. I enjoyed reading your blogs. The birthday one.. oh the things I would tell my 16 year old self. I'd probably start and end with tell myself to be patient. I love this blog about time. thanks for solving the mystery of why the summers now seem to go by in a week or two instead of two months. You are an eloquent writer, and I look forward to your next blog. Thanks for inviting me into your opinions. Thanks so much for all your positive comments and especially for sharing a bit of yourself. Ah...'Patience'...we can all use more at 16 and every year after. Summer is almost here. Enjoy!